Here is what I have been up to this week. 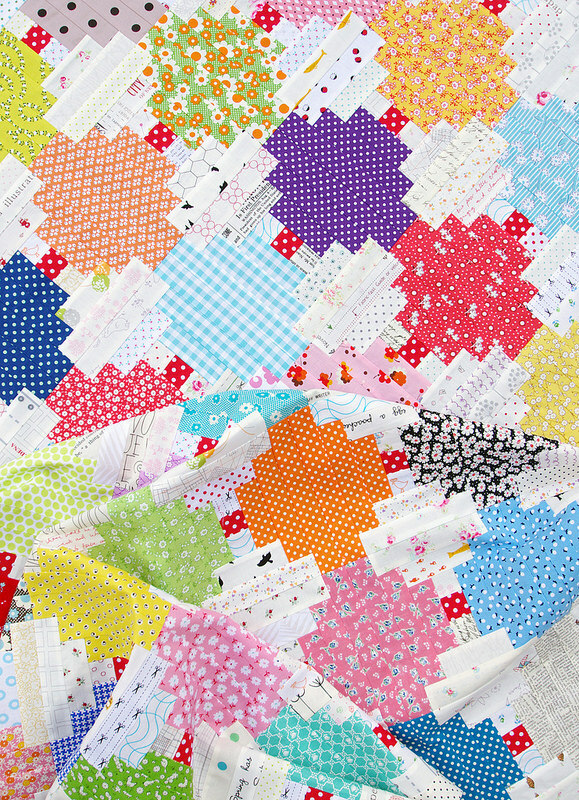 Piecing, piecing, piecing. And truly this is my favorite way to work; playing with color as well as low volume fabrics, and sewing blocks with small strips of fabric. It has been a good week. Busy. But good. This quilt is my interpretation of my new(ish) IKEA rug (and yes I did have to vacuum the rug before taking this photo because I don't have any doubt that you would already know that it is usually decorated with threads). This quilt and the rug both say much about me. Although I LOVE color and I love working with color, my home furnishings and my clothing preference is much more reserved. Instead I add pops of color with my quilts and pillows, and in Winter a colorful knitted shawl drapes permanently around my neck. 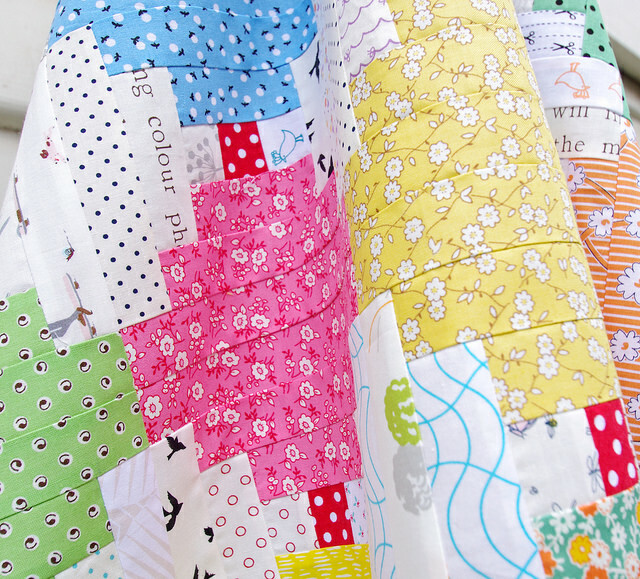 This quilt is made up of traditional Courthouse Steps block. 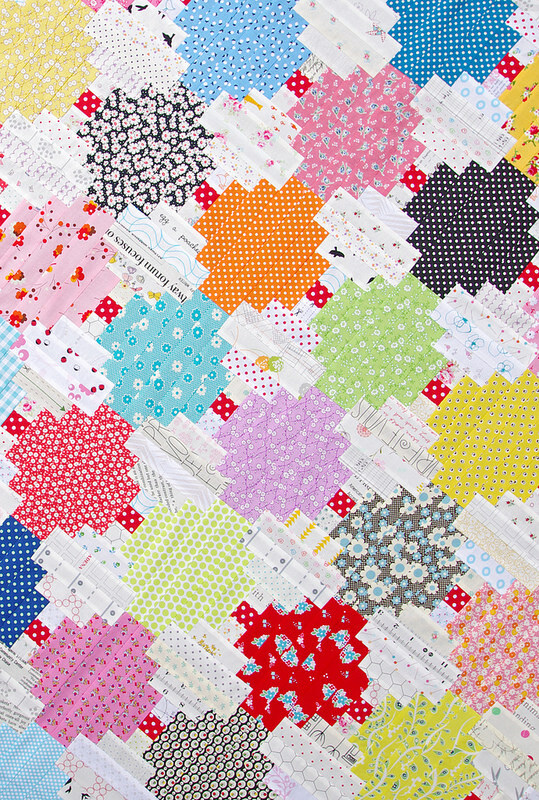 It is a simple block and is pieced from the center out, starting with the small - red with white polka dot - square and adding strips to both sides of that square, alternating color (light/dark) as you go. It was time consuming but I soon found my sewing rhythm. 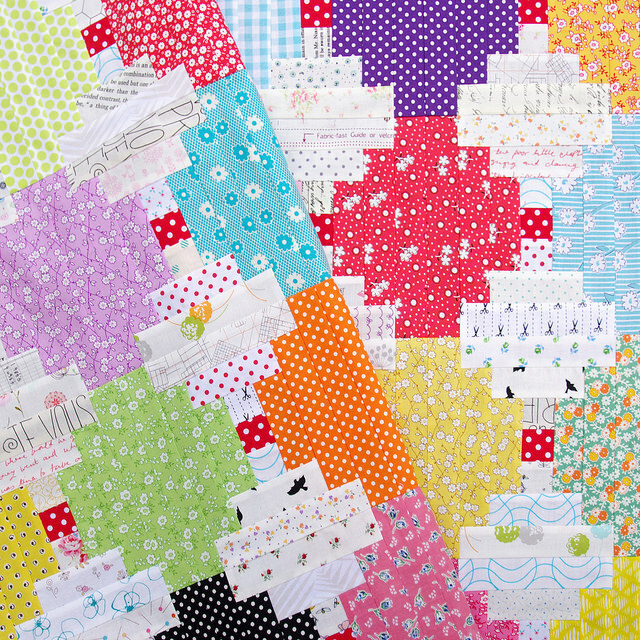 This quilt and layout also required some fabric/color planning as each Courthouse Step block is made up of two adjoining fabrics. 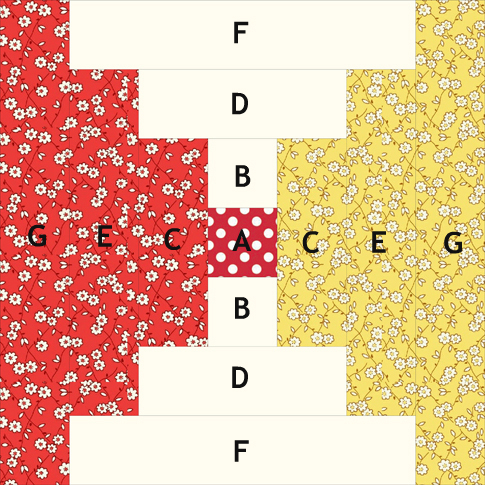 B D and F are low volume fabrics (low contrast fabrics with a light/white background). C E and G are printed/color fabrics. I have chosen small scale designs for stronger contrast and color blocking. I prefer to piece by slightly over-sizing units and trimming back. For example, I cut my strips 1/8th of an inch wider than the 1.5 inch requirement for units C - G and then trimmed back the block at intervals as noted above. My quilt top isn't yet finished. I'd like to add another two rows each of 8 blocks. So it is back to the sewing machine for me. Thanks for sharing this. I may just have to put this on my list of projects to do! Great quilt! I love the colors and the way you interpreted this pattern. Thanks for sharing! This is so you. All neatly pieced and trimmed and beautifully put together! I love to find inspiration for quilts in other things. Rita, this is another amazing quilt....love it. Beautiful! And thank you for the details! Love it .... Thank you for the tutorial, you are ROCK !!! I just cannot believe how prolific you are! Seriously - you do all that cutting and piecing by yourself? No assistants? You are amazing. This is another beauty. I so love your style - so very different from mine. It tells me your life and your mind is beautifully ordered - unlike mine - which a outrageously colorful and chaotic. Would really love to make it to your presentation in --- yikes where was it? Ohio?? Bad timing for me. I love what Carla said above....my feelings exactly! Want to make one of everything you post. So how did you figure out the coloring of the blocks? Intentional row by row sewing? Does that make sense? 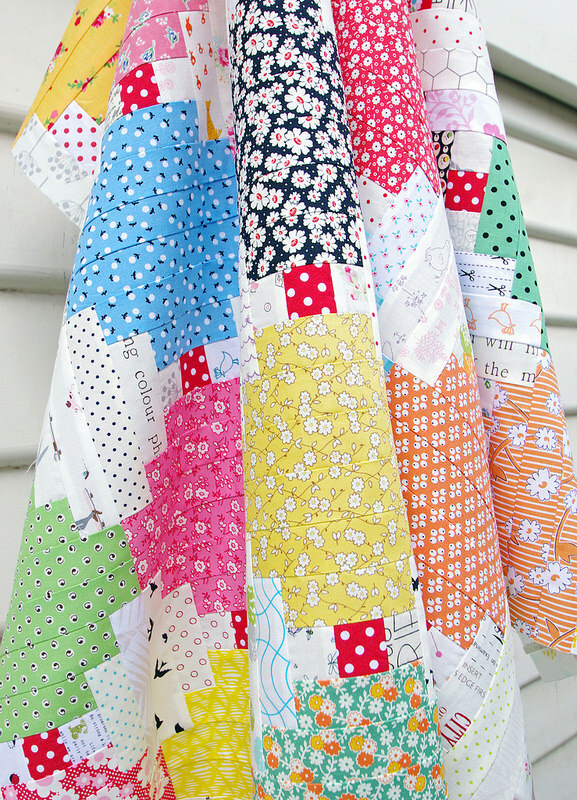 Oh log cabin block....ye are soooooo versatile!! Who ever thought going to court could be so much fun!!! Beautiful. 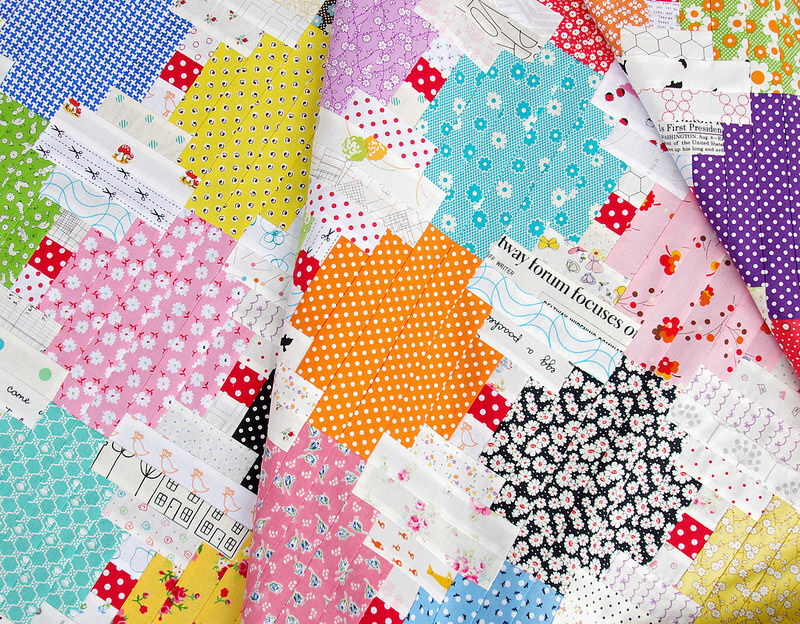 You are without compare when it comes to scrappy fabric choices. Absolutely gorgeous! 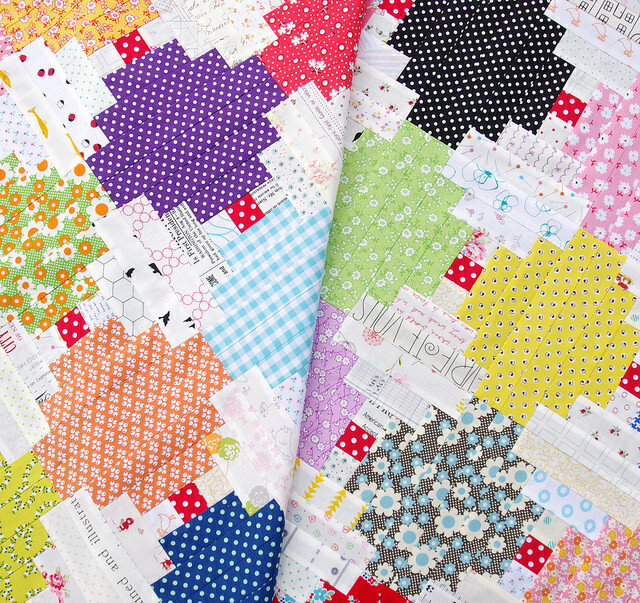 Your quilts never cease to amaze me. Wow,absolutely beautiful.Thanks for the tips! You are amazing and such a wonderful source of inspiration. 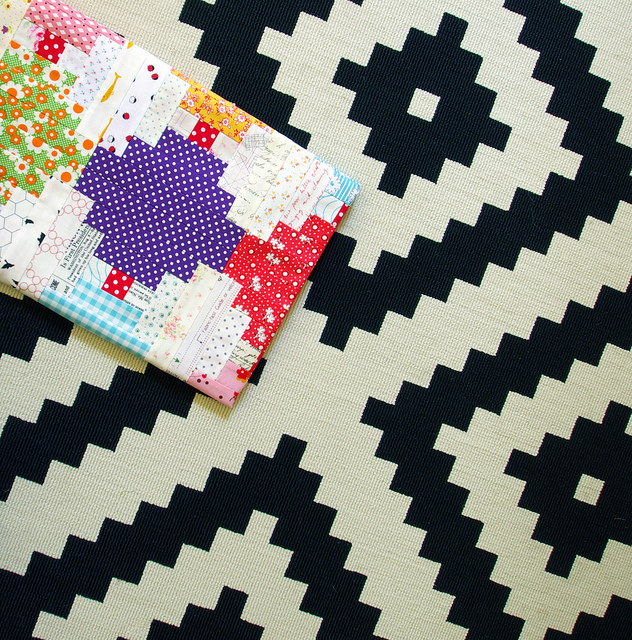 This quilt in progress is simply sweet! A wonderful source of inspiration, yes I agree! Your blog is visited every day by me! I try to read through your posts from earlier years, too. Thanks for all that info! 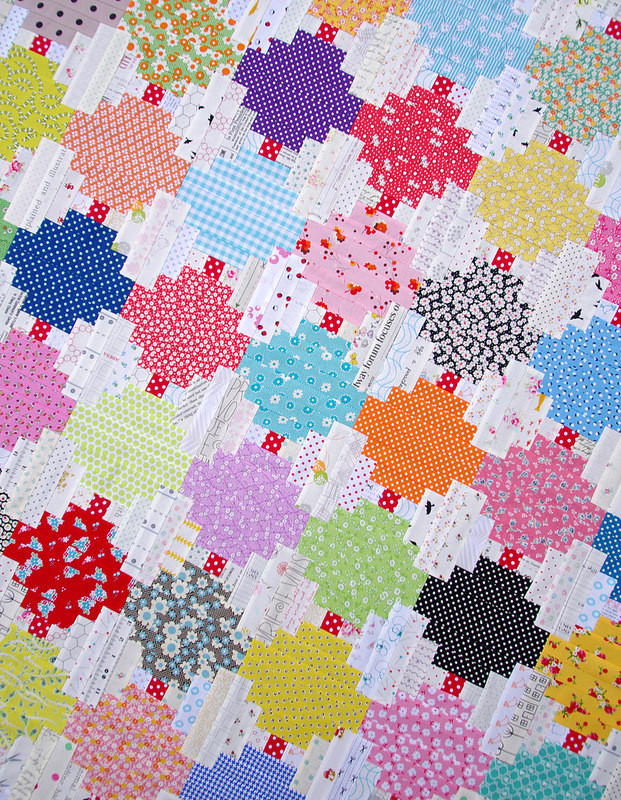 I've seen the block before but never together in a quilt song never envisioned it would make a granny square like shape. Your version is very beautiful! I've got tons of 1.5 inch strips. Need to do this! Thanks!